Packager: Morton Grove Pharmaceuticals, Inc. These highlights do not include all the information needed to use FLUTICASONE PROPIONATE NASAL SPRAY safely and effectively. See full prescribing information for FLUTICASONE PROPIONATE NASAL SPRAY. Fluticasone Propionate Nasal Spray, USP 50 mcg per spray is indicated for the management of the nasal symptoms of perennial nonallergic rhinitis in adult and pediatric patients aged 4 years and older. Administer Fluticasone Propionate Nasal Spray by the intranasal route only. Prime Fluticasone Propionate Nasal Spray before using for the first time or after a period of non-use (1 week or more) by shaking the contents well and releasing 6 sprays into the air away from the face. Shake Fluticasone Propionate Nasal Spray gently before each use. Patients should use Fluticasone Propionate Nasal Spray at regular intervals since its effectiveness depends on its regular use. Maximum effect may take several days and individual patients will experience a variable time to onset and different degree of symptom relief. The recommended starting dosage in adults is 2 sprays (50 mcg of fluticasone propionate each) in each nostril once daily (total daily dose, 200 mcg). The same total daily dose, 1 spray in each nostril administered twice daily (e.g., 8 a.m. and 8 p.m.) is also effective. After the first few days, patients may be able to reduce their dose to 1 spray in each nostril once daily for maintenance therapy. Maximum total daily doses should not exceed 2 sprays in each nostril (total dose, 200 mcg/day). There is no evidence that exceeding the recommended dose is more effective. The recommended starting dosage in adolescents and children, aged 4 years and older is 1 spray in each nostril once daily (total daily dose, 100 mcg). Patients not adequately responding to 1 spray in each nostril may use 2 sprays in each nostril once daily (total daily dose, 200 mcg). Once adequate control is achieved, the dosage should be decreased to 1 spray in each nostril once daily. The maximum total daily dosage should not exceed 2 sprays in each nostril (200 mcg/day). There is no evidence that exceeding the recommended dose is more effective. Fluticasone Propionate Nasal Spray is an aqueous suspension. Each 100-mg spray delivers 50 mcg of fluticasone propionate. Fluticasone Propionate Nasal Spray is contraindicated in patients with hypersensitivity to any of its ingredients [see Warnings and Precautions (5.3), Description (11)]. In clinical trials of 2 to 26 weeks' duration, epistaxis was observed more frequently in subjects treated with Fluticasone Propionate Nasal Spray than those who received placebo [see Adverse Reactions (6.1)]. Postmarketing cases of nasal ulceration have been reported in patients treated with Fluticasone Propionate Nasal Spray [see Adverse Reactions (6.2)]. In clinical trials with fluticasone propionate administered intranasally, the development of localized infections of the nose and pharynx with Candida albicans has occurred. When such an infection develops, it may require treatment with appropriate local therapy and discontinuation of Fluticasone Propionate Nasal Spray. Patients using Fluticasone Propionate Nasal Spray over several months or longer should be examined periodically for evidence of Candida infection or other signs of adverse effects on the nasal mucosa. Postmarketing cases of nasal septal perforation have been reported in patients treated with Fluticasone Propionate Nasal Spray [see Adverse Reactions (6.2)]. Because of the inhibitory effect of corticosteroids on wound healing, patients who have experienced recent nasal ulcers, nasal surgery, or nasal trauma should avoid using Fluticasone Propionate Nasal Spray until healing has occurred. Use of intranasal and inhaled corticosteroids may result in the development of glaucoma and/or cataracts. Therefore, close monitoring is warranted in patients with a change in vision or with a history of increased intraocular pressure, glaucoma, and/or cataracts. Consider referral to an ophthalmologist in patients who develop ocular symptoms or use Fluticasone Propionate Nasal Spray long-term. Hypersensitivity reactions (e.g., anaphylaxis, angioedema, urticaria, contact dermatitis, and rash) have been reported after administration of Fluticasone Propionate Nasal Spray. Discontinue Fluticasone Propionate Nasal Spray if such reactions occur [see Contraindications (4)]. Rarely, immediate hypersensitivity reactions may occur after the administration of Fluticasone Propionate Nasal Spray. Persons who are using drugs that suppress the immune system are more susceptible to infections than healthy individuals. Chickenpox and measles, for example, can have a more serious or even fatal course in susceptible children or adults using corticosteroids. In such children or adults who have not had these diseases or been properly immunized, particular care should be taken to avoid exposure. How the dose, route, and duration of corticosteroid administration affect the risk of developing a disseminated infection is not known. The contribution of the underlying disease and/or prior corticosteroid treatment to the risk is also not known. If a patient is exposed to chickenpox, prophylaxis with varicella zoster immune globulin (VZIG) may be indicated. If a patient is exposed to measles, prophylaxis with pooled intramuscular immunoglobulin (IG) may be indicated. (See the complete prescribing information for VZIG and IG.) If chickenpox develops, treatment with antiviral agents may be considered. Intranasal corticosteroids should be used with caution, if at all, in patients with active or quiescent tuberculous infections of the respiratory tract; systemic fungal, bacterial, viral, or parasitic infections; or ocular herpes simplex. When intranasal corticosteroids are used at higher than recommended dosages or in susceptible individuals at recommended dosages, systemic corticosteroid effects such as hypercorticism and adrenal suppression may appear. If such changes occur, the dosage of Fluticasone Propionate Nasal Spray should be discontinued slowly consistent with accepted procedures for discontinuing oral corticosteroid therapy. The replacement of a systemic corticosteroid with a topical corticosteroid can be accompanied by signs of adrenal insufficiency. In addition, some patients may experience symptoms of corticosteroid withdrawal (e.g., joint and/or muscular pain, lassitude, depression). Patients previously treated for prolonged periods with systemic corticosteroids and transferred to topical corticosteroids should be carefully monitored for acute adrenal insufficiency in response to stress. In patients who have asthma or other clinical conditions requiring long-term systemic corticosteroid treatment, rapid decreases in systemic corticosteroid dosages may cause a severe exacerbation of their symptoms. The use of strong cytochrome P450 3A4 (CYP3A4) inhibitors (e.g., ritonavir, atazanavir, clarithromycin, indinavir, itraconazole, nefazodone, nelfinavir, saquinavir, ketoconazole, telithromycin, conivaptan, lopinavir, nefazodone, voriconazole) with Fluticasone Propionate Nasal Spray is not recommended because increased systemic corticosteroid adverse effects may occur [see Drug Interactions (7.1), Clinical Pharmacology (12.3)]. Intranasal corticosteroids may cause a reduction in growth velocity when administered to pediatric patients [see Use in Specific Populations (8.4)]. Monitor the growth routinely of pediatric patients receiving Fluticasone Propionate Nasal Spray. To minimize the systemic effects of intranasal corticosteroids, including Fluticasone Propionate Nasal Spray, titrate each patient's dose to the lowest dosage that effectively controls his/her symptoms [see Dosage and Administration (2), Use in Specific Populations (8.4)]. In controlled US clinical trials, more than 3,300 subjects with allergic and nonallergic rhinitis received treatment with intranasal fluticasone propionate. In general, adverse reactions in clinical trials have been primarily associated with irritation of the nasal mucous membranes, and the adverse reactions were reported with approximately the same frequency by subjects treated with placebo. Less than 2% of subjects in clinical trials discontinued because of adverse reactions; this rate was similar for vehicle placebo and active comparators. The safety data described below are based on 7 placebo-controlled clinical trials in subjects with allergic rhinitis. The 7 trials included 536 subjects (57 girls and 108 boys aged 4 to 11 years, 137 female and 234 male adolescents and adults) treated with Fluticasone Propionate 200 mcg once daily over 2 to 4 weeks and 2 placebo-controlled clinical trials which included 246 subjects (119 female and 127 male adolescents and adults) treated with Fluticasone Propionate 200 mcg once daily over 6 months (Table 1). Also included in Table 1 are adverse reactions from 2 trials in which 167 children (45 girls and 122 boys aged 4 to 11 years) were treated with Fluticasone Propionate 100 mcg once daily for 2 to 4 weeks. Other adverse reactions with Fluticasone Propionate Nasal Spray observed with an incidence less than or equal to 3% but greater than or equal to 1% and more common than with placebo included: blood in nasal mucus, runny nose, abdominal pain, diarrhea, fever, flu-like symptoms, aches and pains, dizziness, and bronchitis. In addition to adverse events reported from clinical trials, the following adverse events have been identified during postapproval use of intranasal fluticasone propionate. Because these reactions are reported voluntarily from a population of uncertain size, it is not always possible to reliably estimate their frequency or establish a causal relationship to drug exposure. These events have been chosen for inclusion due to either their seriousness, frequency of reporting, or causal connection to fluticasone propionate or a combination of these factors. Hypersensitivity reactions, including angioedema, skin rash, edema of the face and tongue, pruritus, urticaria, bronchospasm, wheezing, dyspnea, and anaphylaxis/anaphylactoid reactions, which in rare instances were severe. Alteration or loss of sense of taste and/or smell and, rarely, nasal septal perforation, nasal ulcer, sore throat, throat irritation and dryness, cough, hoarseness, and voice changes. Dryness and irritation, conjunctivitis, blurred vision, glaucoma, increased intraocular pressure, and cataracts. Cases of growth suppression have been reported for intranasal corticosteroids, including Fluticasone Propionate [see Warnings and Precautions (5.7)]. Fluticasone propionate is a substrate of CYP3A4. The use of strong CYP3A4 inhibitors (e.g., ritonavir, atazanavir, clarithromycin, indinavir, itraconazole, nefazodone, nelfinavir, saquinavir, ketoconazole, telithromycin, conivaptan, lopinavir, nefazodone, voriconazole) with Fluticasone Propionate Nasal Spray is not recommended because increased systemic corticosteroid adverse effects may occur. A drug interaction trial with fluticasone propionate aqueous nasal spray in healthy subjects has shown that ritonavir (a strong CYP3A4 inhibitor) can significantly increase plasma fluticasone propionate exposure, resulting in significantly reduced serum cortisol concentrations [see Clinical Pharmacology (12.3)]. During postmarketing use, there have been reports of clinically significant drug interactions in patients receiving fluticasone propionate products, including Fluticasone Propionate Nasal Spray, USP 50 mcg per spray, with ritonavir, resulting in systemic corticosteroid effects including Cushing's syndrome and adrenal suppression. Coadministration of orally inhaled fluticasone propionate (1,000 mcg) and ketoconazole (200 mg once daily) resulted in a 1.9-fold increase in plasma fluticasone propionate exposure and a 45% decrease in plasma cortisol area under the curve (AUC), but had no effect on urinary excretion of cortisol. There are insufficient data on the use of Fluticasone Propionate Nasal Spray in pregnant women to inform a drug-associated risk. In animals, teratogenicity characteristic of corticosteroids, decreased fetal body weight and/or skeletal variations, were observed in rats, mice, and rabbits with subcutaneously administered maternal toxic doses of fluticasone propionate 5 times, equivalent to, and less than the maximum recommended human daily intranasal dose (MRHDID) on a mcg/m2basis, respectively. (See Animal Data.) However, fluticasone propionate administered via nose-only inhalation to rats decreased fetal body weight, but did not induce teratogenicity at a maternal toxic dose equivalent to the MRHDID on a mcg/m2 basis. (See Animal Data.) Experience with oral corticosteroids suggests that rodents are more prone to teratogenic effects from corticosteroids than humans. The estimated risk of major birth defects and miscarriage for the indicated population is unknown. All pregnancies have a background risk of birth defect, loss, or other adverse outcomes. In the U.S. general population, the estimated risk of major birth defects and miscarriage in clinically recognized pregnancies is 2% to 4% and 15% to 20%, respectively. neonatal cord blood after delivery. Animal Data: In embryofetal development studies with pregnant rats and mice dosed by the subcutaneous route throughout the period of organogenesis, fluticasone propionate was teratogenic in both species. Omphalocele, decreased body weight, and skeletal variations were observed in rat fetuses, in the presence of maternal toxicity, at a dose approximately 5 times the MRHDID of 200 mcg/day (on a mcg/m2 basis with a maternal subcutaneous dose of 100 mcg/kg/day). The rat no observed adverse effect level (NOAEL) was observed at approximately equivalent to the MRHDID (on a mcg/m2 basis with a maternal subcutaneous dose of 30 mcg/kg/day). Cleft palate and fetal skeletal variations were observed in mouse fetuses at a dose approximately equivalent to the MRHDID (on a mcg/m2 basis with a maternal subcutaneous dose of 45 mcg/kg/day). The mouse NOAEL was observed with a dose approximately 0.3 times the MRHDID (on a mcg/m2 basis with a maternal subcutaneous dose of 15 mcg/kg/day). In an embryofetal development study with pregnant rats dosed by the nose-only inhalation route throughout the period of organogenesis, fluticasone propionate produced decreased fetal body weights and skeletal variations, in the presence of maternal toxicity, at a dose approximately equivalent to the MRHDID (on a mcg/m2 basis with a maternal nose-only inhalation dose of 25.7 mcg/kg/day); however, there was no evidence of teratogenicity. The NOAEL was observed with a dose approximately 0.25 times the MRHDID (on a mcg/m2 basis with a maternal nose-only inhalation dose of 5.5 mcg/kg/day). In an embryofetal development study in pregnant rabbits that were dosed by the subcutaneous route throughout organogenesis, fluticasone propionate produced reductions of fetal body weights, in the presence of maternal toxicity, at doses approximately 0.06 times the MRHDID and higher (on a mcg/m2 basis with a maternal subcutaneous dose of 0.57 mcg/kg/day). Teratogenicity was evident based upon a finding of cleft palate for 1 fetus at a dose 0.39 times the MRHDID (on a mcg/m2 basis with a maternal subcutaneous dose of 4 mcg/kg/day). The NOAEL was observed in rabbit fetuses with a dose approximately 0.01 times the MRHDID (on a mcg/m2 basis with a maternal subcutaneous dose of 0.08 mcg/kg/day). rats and oral administration to rabbits. associated with decreases in pup body weight, and had no effects on developmental landmarks, learning, memory, reflexes, or fertility at doses up to 2 times the MRHDID (on a mcg/m2 basis with maternal subcutaneous doses up to 50 mcg/kg/day). There are no available data on the presence of fluticasone propionate in human milk, the effects on the breastfed child, or the effects on milk production. Low concentrations of other corticosteroids have been detected in human milk. The developmental and health benefits of breastfeeding should be considered along with the mother's clinical need for Fluticasone Propionate Nasal Spray and any potential adverse effects on the breastfed child from Fluticasone Propionate Nasal Spray or from the underlying maternal condition. Animal Data: Subcutaneous administration of tritiated fluticasone propionate at a dose of 10 mcg/kg/day to lactating rats resulted in measurable levels in milk. The safety and effectiveness of Fluticasone Propionate Nasal Spray in children aged 4 years and older have been established [see Adverse Reactions (6.1), Clinical Pharmacology (12.3)]. Six hundred fifty (650) subjects aged 4 to 11 years and 440 subjects aged 12 to 17 years were studied in US clinical trials with fluticasone propionate nasal spray. The safety and effectiveness of Fluticasone Propionate Nasal Spray in children younger than 4 years have not been established. Controlled clinical trials have shown that intranasal corticosteroids may cause a reduction in growth velocity when administered to pediatric patients. This effect was observed in the absence of laboratory evidence of hypothalamic-pituitary-adrenal (HPA) axis suppression, suggesting that growth velocity is a more sensitive indicator of systemic corticosteroid exposure in pediatric patients than some commonly used tests of HPA axis function. The long-term effects of this reduction in growth velocity associated with intranasal corticosteroids, including the impact on final adult height, are unknown. The potential for "catch-up" growth following discontinuation of treatment with intranasal corticosteroids has not been adequately studied. The growth of pediatric patients receiving intranasal corticosteroids, including Fluticasone Propionate Nasal Spray, should be monitored routinely (e.g., via stadiometry). The potential growth effects of prolonged treatment should be weighed against the clinical benefits obtained and the risks associated with alternative therapies. To minimize the systemic effects of intranasal corticosteroids, including Fluticasone Propionate Nasal Spray, each patient's dosage should be titrated to the lowest dosage that effectively controls his/her symptoms. A 1-year placebo-controlled trial was conducted in 150 pediatric subjects (aged 3 to 9 years) to assess the effect of Fluticasone Propionate Nasal Spray (single daily dose of 200 mcg) on growth velocity. From the primary population receiving Fluticasone Propionate Nasal Spray (n = 56) and placebo (n = 52), the point estimate for growth velocity with Fluticasone Propionate Nasal Spray was 0.14 cm/year lower than placebo (95% CI: -0.54, 0.27 cm/year). Thus, no statistically significant effect on growth was noted compared with placebo. No evidence of clinically relevant changes in HPA axis function or bone mineral density was observed as assessed by 12-hour urinary cortisol excretion and dual-energy x-ray absorptiometry, respectively. The potential for Fluticasone Propionate Nasal Spray to cause growth suppression in susceptible patients or when given at higher than recommended dosages cannot be ruled out. A limited number of subjects aged 65 years and older (n = 129) or 75 years and older (n = 11) have been treated with Fluticasone Propionate Nasal Spray in clinical trials. While the number of subjects is too small to permit separate analysis of efficacy and safety, the adverse reactions reported in this population were similar to those reported by younger patients. In general, dose selection for an elderly patient should be cautious, usually starting at the low end of the dosing range, reflecting the greater frequency of decreased hepatic, renal, or cardiac function, and of concomitant disease or other drug therapy. Formal pharmacokinetic trials using Fluticasone Propionate Nasal Spray have not been conducted in subjects with hepatic impairment. Since fluticasone propionate is predominantly cleared by hepatic metabolism, impairment of liver function may lead to accumulation of fluticasone propionate in plasma. Therefore, patients with hepatic disease should be closely monitored. Formal pharmacokinetic trials using Fluticasone Propionate Nasal Spray have not been conducted in subjects with renal impairment. Chronic overdosage may result in signs/symptoms of hypercorticism [see Warnings and Precautions (5.5)]. Intranasal administration of 2 mg (10 times the recommended dose) of fluticasone propionate twice daily for 7 days was administered to healthy human volunteers. Adverse events reported with fluticasone propionate were similar to placebo, and no clinically significant abnormalities in laboratory safety tests were observed. Single oral doses up to 16 mg have been studied in human volunteers with no acute toxic effects reported. Repeat oral doses up to 80 mg daily for 10 days in volunteers and repeat oral doses up to 10 mg daily for 14 days in patients were well tolerated. Adverse reactions were of mild or moderate severity, and incidences were similar in active and placebo treatment groups. Acute overdosage with this dosage form is unlikely since 1 bottle of Fluticasone Propionate Nasal Spray contains approximately 8 mg of fluticasone propionate. Fluticasone propionate is a white powder with a molecular weight of 500.6, and the empirical formula is C25H31F3O5S. It is practically insoluble in water, freely soluble in dimethyl sulfoxide and dimethylformamide, and slightly soluble in methanol and 95% ethanol. Fluticasone Propionate Nasal Spray, 50 mcg is an aqueous suspension of microfine fluticasone propionate for topical administration to the nasal mucosa by means of a metering, atomizing spray pump. Fluticasone Propionate Nasal Spray also contains microcrystalline cellulose and carboxymethylcellulose sodium, dextrose, 0.02% w/w benzalkonium chloride, polysorbate 80, and 0.25% w/w phenylethyl alcohol, and has a pH between 5 and 7. 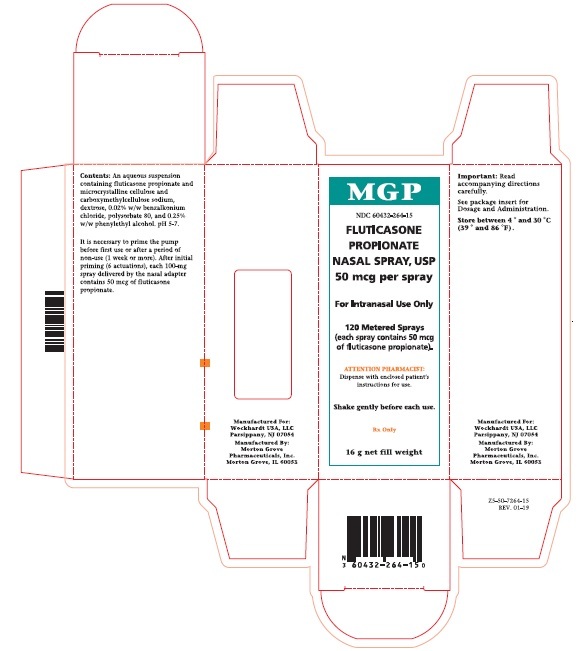 After initial priming, each actuation delivers 50 mcg of fluticasone propionate in 100 mg of formulation through the nasal adapter. Fluticasone propionate is a synthetic trifluorinated corticosteroid with anti-inflammatory activity. Fluticasone propionate has been shown in vitro to exhibit a binding affinity for the human glucocorticoid receptor that is 18 times that of dexamethasone, almost twice that of beclomethasone-17-monopropionate (BMP), the active metabolite of beclomethasone dipropionate, and over 3 times that of budesonide. Data from the McKenzie vasoconstrictor assay in man are consistent with these results. The clinical significance of these findings is unknown. The precise mechanism through which fluticasone propionate affects rhinitis symptoms is not known. Corticosteroids have been shown to have a wide range of effects on multiple cell types (e.g., mast cells, eosinophils, neutrophils, macrophages, lymphocytes) and mediators (e.g., histamine, eicosanoids, leukotrienes, cytokines) involved in inflammation. In 7 trials in adults, Fluticasone Propionate Nasal Spray has decreased nasal mucosal eosinophils in 66% of patients (35% for placebo) and basophils in 39% of patients (28% for placebo). The direct relationship of these findings to long-term symptom relief is not known. The potential systemic effects of Fluticasone Propionate Nasal Spray on the HPA axis were evaluated. Fluticasone Propionate Nasal Spray given as 200 mcg once daily or 400 mcg twice daily was compared with placebo or oral prednisone 7.5 or 15 mg given in the morning. Fluticasone Propionate Nasal Spray at either dosage for 4 weeks did not affect the adrenal response to 6-hour cosyntropin stimulation, while both dosages of oral prednisone significantly reduced the response to cosyntropin. A study specifically designed to evaluate the effect of Fluticasone Propionate on the QT interval has not been conducted. The activity of Fluticasone Propionate Nasal Spray is due to the parent drug, fluticasone propionate. Due to the low bioavailability by the intranasal route, the majority of the pharmacokinetic data was obtained via other routes of administration. Indirect calculations indicate that fluticasone propionate delivered by the intranasal route has an absolute bioavailability averaging less than 2%. Trials using oral dosing of labeled and unlabeled drug have demonstrated that the oral systemic bioavailability of fluticasone propionate is negligible (<1%), primarily due to incomplete absorption and presystemic metabolism in the gut and liver. After intranasal treatment of patients with rhinitis for 3 weeks, fluticasone propionate plasma concentrations were above the level of detection (50 pg/mL) only when recommended doses were exceeded and then only in occasional samples at low plasma levels. The percentage of fluticasone propionate bound to human plasma proteins averaged 99%. Fluticasone propionate is weakly and reversibly bound to erythrocytes and is not significantly bound to human transcortin. Following intravenous dosing, fluticasone propionate showed polyexponential kinetics and had a terminal elimination half-life of approximately 7.8 hours. The total blood clearance of fluticasone propionate is high (average: 1,093 mL/min), with renal clearance accounting for less than 0.02% of the total. Metabolism: The only circulating metabolite detected in man is the 17β-carboxylic acid derivative of fluticasone propionate, which is formed through the CYP3A4 pathway. This metabolite had less affinity (approximately 1/2,000) than the parent drug for the glucocorticoid receptor of human lung cytosol in vitro and negligible pharmacological activity in animal studies. Other metabolites detected in vitro using cultured human hepatoma cells have not been detected in man. Excretion: Less than 5% of a radiolabeled oral dose was excreted in the urine as metabolites, with the remainder excreted in the feces as parent drug and metabolites. Fluticasone propionate nasal spray was not studied in any special populations, and no gender-specific pharmacokinetic data have been obtained. Inhibitors of Cytochrome P450 3A4: Ritonavir: Fluticasone propionate is a substrate of CYP3A4. Coadministration of fluticasone propionate and the strong CYP3A4 inhibitor, ritonavir, is not recommended based upon a multiple-dose, crossover drug interaction trial in 18 healthy subjects. Fluticasone propionate aqueous nasal spray (200 mcg once daily) was coadministered for 7 days with ritonavir (100 mg twice daily). Plasma fluticasone propionate concentrations following fluticasone propionate aqueous nasal spray alone were undetectable (<10 pg/mL) in most subjects, and when concentrations were detectable, peak levels (Cmax) averaged 11.9 pg/mL (range: 10.8 to 14.1 pg/mL) and AUC(0–τ) averaged 8.43 pg•h/mL (range: 4.2 to 18.8 pg•h/mL). Fluticasone propionate Cmax and AUC(0–τ) increased to 318 pg/mL (range: 110 to 648 pg/mL) and 3,102.6 pg•h/mL (range: 1,207.1 to 5,662.0 pg•h/mL), respectively, after coadministration of ritonavir with fluticasone propionate aqueous nasal spray. This significant increase in plasma fluticasone propionate exposure resulted in a significant decrease (86%) in serum cortisol AUC. Ketoconazole: Coadministration of orally inhaled fluticasone propionate (1,000 mcg) and ketoconazole (200 mg once daily) resulted in a 1.9-fold increase in plasma fluticasone propionate exposure and a 45% decrease in plasma cortisol AUC, but had no effect on urinary excretion of cortisol. Erythromycin: In a multiple-dose drug interaction study, coadministration of orally inhaled fluticasone propionate (500 mcg twice daily) and erythromycin (333 mg 3 times daily) did not affect fluticasone propionate pharmacokinetics. Fluticasone propionate demonstrated no tumorigenic potential in mice at oral doses up to 1,000 mcg/kg (approximately 20 times the MRHDID in adults and approximately 10 times the MRHDID in children on a mcg/m2 basis) for 78 weeks or in rats at inhalation doses up to 57 mcg/kg (approximately 25 and 20 times the MRHDID in adults and children, respectively, on a mcg/m2 basis) for 78 weeks or in rats at inhalation doses up to 57 mcg/kg (approximately 3 and 2 times the MRHDID in adults and children, respectively, on a mcg/m2 basis) for 104 weeks. Fertility and reproductive performance were unaffected in male and female rats at subcutaneous doses up to 50 mcg/kg (approximately 2 times the MRHDID in adults on a mcg/m2 basis). Perennial Nonallergic Rhinitis: Three randomized, double-blind, parallel-group, vehicle placebo-controlled trials were conducted in 1,191 subjects to investigate regular use of Fluticasone Propionate Nasal Spray in subjects with perennial nonallergic rhinitis. These trials evaluated subject-rated total nasal symptom scores (TNSS) that included nasal obstruction, postnasal drip, rhinorrhea in subjects treated for 28 days of double-blind therapy and in 1 of the 3 trials for 6 months of open-label treatment. Two of these trials demonstrated that subjects treated with Fluticasone Propionate Nasal Spray (100 mcg twice daily) exhibited statistically significant decreases in TNSS compared with subjects treated with vehicle. Fluticasone Propionate Nasal Spray, 50 mcg is supplied in an amber glass bottle fitted with a white metering atomizing pump, white nasal adapter, and transparent dust cap in a box of 1 (NDC 60432-264-15) with FDA-approved Patient Labeling (see Patient Instructions for Use for proper actuation of the device). Each bottle contains a net fill weight of 16 g and will provide 120 actuations. Each actuation delivers 50 mcg of fluticasone propionate in 100 mg of formulation through the nasal adapter. The correct amount of medication in each spray cannot be assured after 120 sprays even though the bottle is not completely empty. The bottle should be discarded when the labeled number of actuations has been used. Store between 4° and 30°C (39° and 86°F). Inform patients that treatment with Fluticasone Propionate Nasal Spray may lead to adverse reactions, which include epistaxis and nasal ulceration. Candida infection may also occur with treatment with Fluticasone Propionate Nasal Spray. In addition, Fluticasone Propionate Nasal Spray has been associated with nasal septal perforation and impaired wound healing. Patients who have experienced recent nasal ulcers, nasal surgery, or nasal trauma should not use Fluticasone Propionate Nasal Spray until healing has occurred [see Warnings and Precautions (5.1)]. Inform patients that glaucoma and cataracts are associated with nasal and inhaled corticosteroid use. Advise patients to notify their healthcare providers if a change in vision is noted while using Fluticasone Propionate Nasal Spray [see Warnings and Precautions (5.2)]. Inform patients that hypersensitivity reactions, including anaphylaxis, angioedema, urticaria, contact dermatitis, and rash, may occur after administration of Fluticasone Propionate Nasal Spray. If such reactions occur, patients should discontinue use of Fluticasone Propionate Nasal Spray [see Warnings and Precautions (5.3)]. Warn patients who are on immunosuppressant doses of corticosteroids to avoid exposure to chickenpox or measles and if they are exposed to consult their healthcare provider without delay. Inform patients of potential worsening of existing tuberculosis; fungal, bacterial, viral, or parasitic infections; or ocular herpes simplex [see Warnings and Precautions (5.4)]. Advise parents that Fluticasone Propionate Nasal Spray may cause a reduction in growth velocity when administered to pediatric patients. Physicians should closely follow the growth of children and adolescents taking corticosteroids by any route [see Warnings and Precautions (5.7), Pediatric Use (8.4)]. Inform patients that they should use Fluticasone Propionate Nasal Spray on a regular basis. Fluticasone Propionate Nasal Spray, like other corticosteroids, does not have an immediate effect on rhinitis symptoms. Maximum benefit may not be reached for several days. Patients should not increase the prescribed dosage but should contact their healthcare providers if symptoms do not improve or if the condition worsens. Inform patients to avoid spraying Fluticasone Propionate Nasal Spray in their eyes and mouth. Fluticasone Propionate Nasal Spray is a prescription medicine used to treat non-allergy nasal symptoms such as runny nose, stuffy nose, sneezing, and nasal itching in adults and children aged 4 years and older. It is not known if Fluticasone Propionate Nasal Spray is safe and effective in children younger than 4 years of age. Do not use Fluticasone Propionate Nasal Spray if you are allergic to fluticasone propionate or any of the ingredients in Fluticasone Propionate Nasal Spray. See "What are the ingredients in Fluticasone Propionate Nasal Spray?" below for a complete list of ingredients. have or have had eye problems, such as glaucoma or cataracts. are pregnant or planning to become pregnant. It is not known if Fluticasone Propionate Nasal Spray may harm your unborn baby. are breastfeeding or plan to breastfeed. It is not known if Fluticasone Propionate Nasal Spray passes into your breast milk and if it can harm your baby. Tell your healthcare provider about all the medicines you take, including prescription and over-the-counter medicines, vitamins, and herbal supplements. Fluticasone Propionate Nasal Spray and certain other medicines may interact with each other. This may cause serious side effects. Especially, tell your healthcare provider if you take antifungal or anti-HIV medicines. How should I use Fluticasone Propionate Nasal Spray? Read the step-by-step instructions for using Fluticasone Propionate Nasal Spray at the end of this Patient Information. Fluticasone Propionate Nasal Spray is for use in your nose only. Do not spray it in your eyes or mouth. Children should use Fluticasone Propionate Nasal Spray with an adult's help, as instructed by the child's healthcare provider. Use Fluticasone Propionate Nasal Spray exactly as your healthcare provider tells you. Do not use Fluticasone Propionate Nasal Spray more often than prescribed. Fluticasone Propionate Nasal Spray may take several days of regular use for your rhinitis symptoms to get better. If your symptoms do not improve or get worse, call your healthcare provider. You will get the best results if you keep using Fluticasone Propionate Nasal Spray regularly each day without missing a dose. After you begin to feel better, your healthcare provider may decrease your dose. Do not stop using Fluticasone Propionate Nasal Spray unless your healthcare provider tells you to do so. sores (ulcers) in your nose. a certain fungal infection in your nose, mouth, and/or throat (thrush). hole in the cartilage of your nose (nasal septal perforation). slow wound healing. You should not use Fluticasone Propionate Nasal Spray until your nose has healed if you have a sore in your nose, have had surgery on your nose, or if your nose has been injured. glaucoma and cataracts. Using nasal and inhaled corticosteroid medicines may result in you developing glaucoma and/or cataracts. Your healthcare provider may have you see an eye doctor (ophthalmologist) if you develop eye symptoms or use Fluticasone Propionate Nasal Spray for long periods of time. Tell your healthcare provider if you have any changes in your eye sight while using Fluticasone Propionate Nasal Spray. weakened immune system and increased chance of getting infections (immunosuppression). Taking medicines that weaken your immune system makes you more likely to get infections and can make certain infections worse. These infections may include tuberculosis (TB), ocular herpes simplex infections, and infections caused by fungi, bacteria, viruses, and parasites. Avoid contact with people who have a contagious disease such as chickenpox or measles while using Fluticasone Propionate Nasal Spray. If you come in contact with someone who has chickenpox or measles call your healthcare provider right away. These are not all the possible side effects with Fluticasone Propionate Nasal Spray. How do I store Fluticasone Propionate Nasal Spray? Store Fluticasone Propionate between 39°F and 86°F (4°C and 30°C). Keep Fluticasone Propionate Nasal Spray and all medicines out of the reach of children. General information about the safe and effective use of Fluticasone Propionate Nasal Spray. Medicines are sometimes prescribed for purposes not mentioned in a Patient Information leaflet. Do not use Fluticasone Propionate Nasal Spray for a condition for which it was not prescribed. Do not give your Fluticasone Propionate Nasal Spray to other people, even if they have the same condition that you have. It may harm them. You can ask your pharmacist or healthcare provider for information about Fluticasone Propionate Nasal Spray that was written for healthcare professionals. What are the ingredients in Fluticasone Propionate Nasal Spray? Inactive ingredients: microcrystalline cellulose, carboxymethylcellulose sodium, dextrose, 0.02% w/w benzalkonium chloride, polysorbate 80, and 0.25% w/w phenylethyl alcohol. For more information about Fluticasone Propionate Nasal Spray, call 1-800-346-6854. Fluticasone Propionate Nasal Spray is for use in your nose only. Read this information before you start using your Fluticasone Propionate Nasal Spray. Your Fluticasone Propionate Nasal Spray must be primed before you use it for the first time and when you have not used it for a week or more. • Shake the bottle gently and then remove the dust cover (See Figure A). applicator and your thumb underneath the bottle. Press down and release 6 times until a fine spray appears (See Figure B). The pump is now ready for use. Step 2. Close 1 nostril. Tilt your head forward slightly and, keeping the bottle upright, carefully insert the nasal applicator into the other nostril (See Figure C). Step 3. Start to breathe in through your nose, and while breathing in press firmly and quickly down 1 time on the applicator to release the spray. To get a full dose, use your forefinger and middle finger to spray while supporting the base of the bottle with your thumb. Avoid spraying in your eyes. Breathe in gently through the nostril. Step 5. If a second spray is required in that nostril, repeat steps 2 through 4 . Step 7. 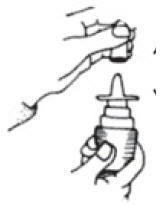 Wipe the nasal applicator with a clean tissue and replace the dust cover (See Figure D). Do not use this bottle for more than the labeled number of sprays even though the bottle is not completely empty. Before you throw the bottle away, you should talk to your healthcare provider to see if a refill is needed. Do not take extra doses or stop taking Fluticasone Propionate Nasal Spray without talking to your healthcare provider. Remove the dust cover and then gently pull upwards to free the nasal applicator. Wash the applicator and dust cover under warm tap water. Allow to dry at room temperature. Place the applicator and dust cover back on the bottle. If the nasal applicator becomes blocked, it can be removed and left to soak in warm water. Rinse the nasal applicator with cold tap water. Dry the nasal applicator and place it back on the bottle. 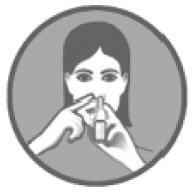 Do not try to unblock the nasal applicator by inserting a pin or other sharp object. Store Fluticasone Propionate Nasal Spray between 39°F and 86°F (4°C and 30°C). Do not use your Fluticasone Propionate Nasal Spray after the date shown as "EXP" on the label or box.